Building on the classic style of the previous 2 ships, the Disney Magic and the Disney Wonder, the Disney Dream is a valiant vessel distinguished for its classic early 20th-century design—which harkens back to the golden age of cruising—and state-of-the-art technology. As can be expected from Disney, the cruise liner was specially designed with families in mind, combining sleek style and convenient facilities with splashes of magic and cruise-industry firsts—like the splash-tacular AquaDuck, the very first water coaster at sea. 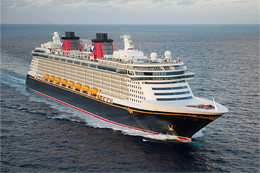 Only the Disney Cruise Line offers fun-filled activities and experiences for cruisers of all ages, favorite Disney Characters in Broadway-style shows, dining at extraordinary eateries, fabulous family-size staterooms, a private island paradise, and amenities and service that define Disney. Find fun for all with delightful Disney-style activities designed for every age group. Your kids can play with new friends, you can enjoy adult-only activities, or you can all enjoy quality family-together time. Thrill to all kinds of exhilarating venues with inspiring shows for every member of the family. See again and again why nobody creates entertainment like Disney. Discover Disney's perfect private paradise — for kids and teens, it's Never Land; for adults, it's Shangri-La. Step off the ship and you know, instantly, you've arrived at a magical place. Experience savory worlds that could only have been designed by Disney. Gather together to share stories of your day as you "rotate" each night through three uniquely themed restaurants with distinctive cuisine — always staffed with your own personal servers who know and anticipate your tastes. Stretch out in a Disney stateroom, designed with the family in mind. Delight in substantially more space for relaxation than you'd find on most other cruise ships. Discover split baths, ample storage, natural woods, imported tiles and superior attention to detail in your home away from home.